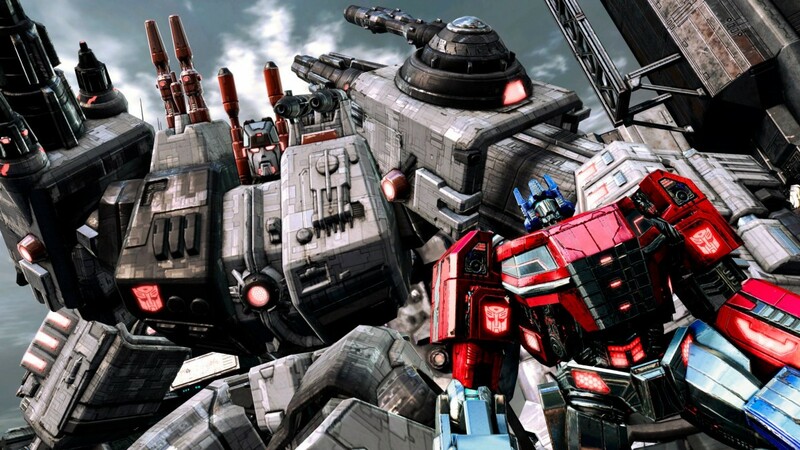 We have less than a week until "Transformers: Fall of Cybertron" is released! A game that I'm HIGHLY anticipating. Take a look at the Launch trailer that was released today and my opinions on the pre-release demo after the jump! Today, High Moon and Activision have released the launch trailer for their highly anticipated sequel to 2011's "TF:WfC"... "Transformers: Fall of Cybertron"! The release trailer gives us plenty of in game cinematics and gameplay, plenty of pop-up reviews of how you must own this, and is goose-bump inducingly narrated by Peter Cullen, Optimus Prime himself! Now... since I've pre-ordered my copy over at my local Gamestop, I was able to download the free demo 4 days early. The nationwide launch was on 7.31, so on the 27th I was slinging ion blaster fire at my opponents and changing my armor for hours. My initial multi-player run through the game was, gameplay wise, a similar experience to the multi-player in War. 6-Bot teams vying to control nodes or be the first to scrap 40 of their opponents. It's really nothing new except the maps in concept. 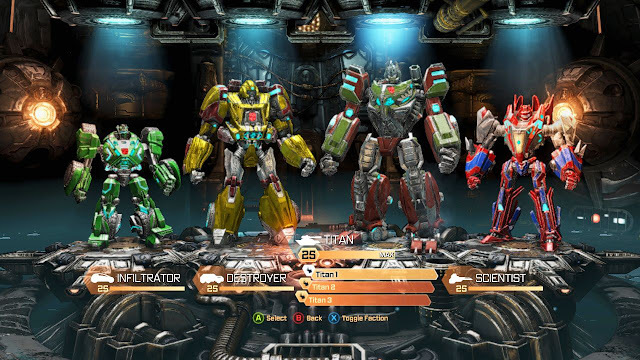 Where FoC's multi-player shines over WfC's is the character customization. The 4 'new' classes... Infiltrator (formerly the Scout), Destroyer (formerly the Leader), Titan (formerly the Soldier) and Scientist (formerly the ... umm... Scientist) all have multiple armor sets that become available as you gain levels. Each armor set is composed of head, shoulders, arms, chest, legs, wheels/wings, and 'stickers'. Progression through the levels (which will once again max out at 20) unlocks parts that help you customize the look of your character. You still get colors to choose from, but the palette in FoC is much greater. Overall, a huge leap beyond WfC's 2 tone color "customization". Akin to WfC, players will also be able to customize their bots weapons loadouts. A huge enhancement to this is the ability to add upgrades to the weapons themselves! Extra clips, better stability, less recoil... there are some pretty fun new options. With single player, we only get a taste of what the story will be. The 'Exodus' mission puts you in Bumblebee's now mute wheels to teach how to use your controller as well as kick-start the story. The second mission is 'Death from Above'; which puts you behind Vortex the Combaticon's rotors and giving you a taste of the game's flying mechanic as well as a look at Cybertron's large landscapes. Both levels are gorgeous to look at with excellent, story-driven cut-scenes. My first issue with the game is the controller layout. Like WfC, the initial configuration puts your transformation control as a thumb-stick click. If you flail wildly while gaming, this will cause you to transform when you don't want to. A good default is changing to one of the other preset control schemes which switches your transform command to a button. Sadly, this puts your melee command on said thumb-stick. For me personally, I hate having to use the thumb-stick click for anything. I'm too busy mashing buttons and moving the thumb-sticks for other things and almost always inadvertently click it for some reason. I think it's a terrible idea and really wish that I could change both transformation and melee commands to buttons. My second issue with the game is the lack of Co-Op. While I understand the decision to remove Co-Op from the game (they said it was for enemy AI processing power) I think that Co-Op could have made the game that much more fun. I'll still be able to play multi-player with my TF buds, so I'm good with that. Overall, I'm really looking forward to playing this game. 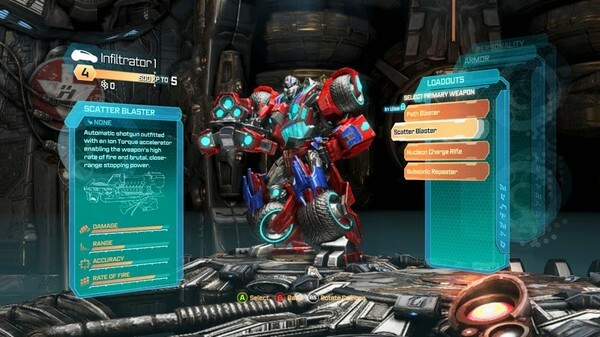 War for Cybertron was a solid game and I think the sequel is gearing up to be just as good if not better. I think I feel a case of Cosmic Rust coming on that will keep me from work on Tuesday. Opinions by Scion of Primus. Other data culled from sources. I am addicted to this demo. I am entirely honest when I say it's the best thing I've ever played. I'm a transfan, so this beats crap like Call Of Duty anyday... And I don't regularly buy video games... Unless they're TF ones. They did just recently raise the Demo's level cap to 8. So, perhaps there? I haven't played the Demo in a little while and the game launches this Tuesday. I'm more waiting to play the campaign. Multi-player will be played, but most of my enjoyment is in the story.